It really all started with this flashy guy. We did it all wrong too, since you’re not supposed to buy a buck first and you’re not supposed to buy for color and really, if you want to do dairy goats “right” you should know your bloodlines and diseases in addition to volumes of additional critical information (!). The good news was that Milkyway had good genetics and was free of disease. He taught us a lot about goat behavior, goat health and management, what we really want (and most importantly what we don’t want) in our herd. We have now finally done the research and have added genetics from Stoney Heights Farm, Windsong Farm, and Saada. 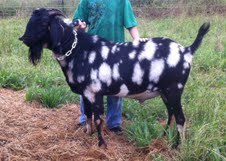 For more information about our goat herd click here.